You wouldn’t think that a commercial general contractor that provides tenant improvements has much to do with building reconstruction services in Kansas City. Reconstruction services are typically associated with catastrophes such as water and fire damage and mold remediation. However, after the initial cleanup, a general contractor is employed to rebuild or reconstruct the building to its original condition as well as provide construction management services. In most situations a design professional and building permit is required. The damaged building was most likely constructed in accordance with older building codes. Pulling a new permit typically requires the new work to be in accordance with current building codes which are more stringent than the old. Once the restoration is completed, the design professional and general contractor will encounter a list of building code issues in which they must comply, these typically add costs and time to the project. Example 1: A fire damages a structural support wall in a warehouse that supports a mezzanine. The initial design used a 50 pounds per square foot (psf) live load which satisfies normal office use. Since part of the mezzanine is used as a corridor, the required uniform load per 2018 International Building Code is 80 psf. The building reconstruction now requires additional structural enhancements to the wall as well as to the footing in the concrete slab. Example 2: Water damage from a frozen pipe burst destroys drywall and insulation along with electrical outlets, switches and lights. The 2018 International Energy Conservation Code (IECC) includes more rigorous minimum requirements on exterior wall and roof insulation. It also requires electrical fixtures that are more energy efficient. As a result, an additional 6” needs to be added to the roof insulation as well as LED light fixtures and occupancy sensor switches which are required in the reconstruction. All of this adds money and time to the project. The list below includes typical areas in reconstruction that are affected and may require updates to comply with current building codes. And as a result, they may add time and money to the overall project. The design professional(s) and the general contractor providing building reconstruction services need to consider all the possible building codes that may affect the project such as the International Building Code (IBC), International Fire Code (IFC), International Mechanical Code (IMC), International Plumbing Code (IPC), International Electrical Code (IEC), International Energy Conservation Code (IECC), National Electrical Code (NEC), NFPA Life Safety Code,and Americans with Disabilities Act (ADA) Standards for Accessible Design. Each jurisdiction in the United States adopts their own specific codes and the list above may not be entirely applicable. Building reconstruction service is not only a specialized type of service offered by a general contractor, but requires a thorough understanding of building codes and how they will affect the overall acceptance by the jurisdiction in which the project resides. Otherwise, there could be time and money wasted to rebuild components of the building that may never pass inspection, thus obtaining a certificate of occupancy becomes impossible. 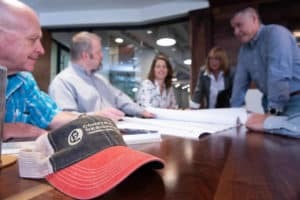 Construction DesignWorks uses its hands-on approach and design and construction expertise to create and develop a winning design-build team that is specialized for each customer. Their complete turnkey building solutions align with the unique business needs of various types of real estate. Construction DesignWorks, LLC is located at 6657 Woodland Drive in Shawnee, Kansas. If you are looking at business remodeling contractors or for more information about interior design-build, call (913) 745-4727 or visit their website http://constructiondesignworks.net. View original article on building reconstruction services here.